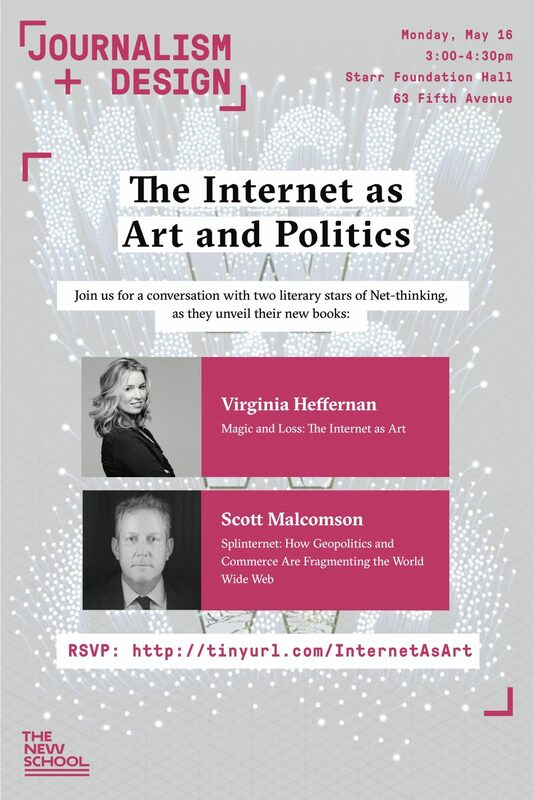 Join us for a debate on the politics and art of the Web, as two literary stars of Net-thinking, Virginia Heffernan and Scott Malcolmson, unveil much-anticipated books: Heffernan’s Magic and Loss: The Internet as Art and Malcomson’s Splinternet: How Geopolitics and Commerce Are Fragmenting the World Wide Web. Virginia Heffernan writes about culture, digital and nondigital, for The New York Times, The Wall Street Journal, WIRED, Politico, Mother Jones, The New Yorker and many other publications. Her cultural criticism is regularly anthologized. She’s written for television and theater, mostly comedy, and, in 2005, she and Mike Albo published a comic novel, The Underminer: The Best Friend Who Casually Destroys Your Life. She works as an editorial strategist for startups and VC firms. In 2002, she received her Ph.D. in English from Harvard. Scott Malcomson has worked as a journalist in Africa, Latin America, the Middle East, the Pacific islands, Europe and Asia as well as across the United States. His books and other writing have been mainly about politics and conflict (Tuturani, 1990; Empire’s Edge, 1994; Generation’s End, 2010), though he has written extensively about race (One Drop of Blood, 2000) and about literature. Malcomson has also served as a senior official at the United Nations and the U.S. State Department.